Las Vegas retailers will get a dose of holiday cheer this shopping season if revenue numbers meet the expectations of Los Angeles-based CBRE Group, the world’s largest commercial real-estate investment manager. The company tracks and interprets consumer spending statistics worldwide and forecasts strong retail numbers to end 2016. COURTESY Shopping Centers are increasingly providing entertainment incentives to attract holiday shoppers. 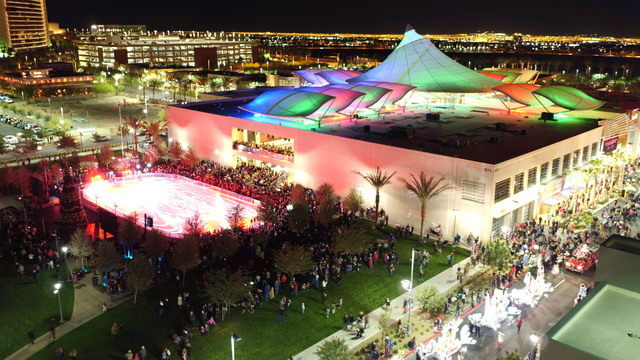 Downtown Summerlin offers a holiday parade Friday and Saturday nights through Dec. 10 and Rock Rink ice skating facility, which closes in mid-January. 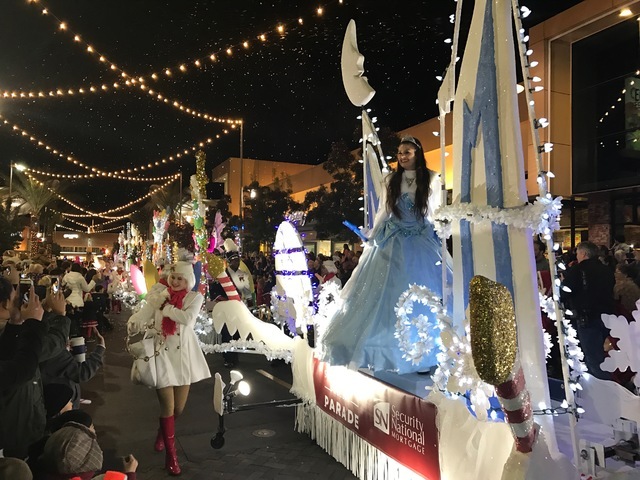 Downtown Summerlin hosts its annual holiday parade Friday and Saturday nights, Nov. 18-Dec. 10. Malls and shopping centers are increasingly employing entertainment offering to attract shoppers. Photo courtesy of Downtown Summerlin. Richard Brian/Las Vegas Business Press A woman lacking a shopping cart looks for the deals during the grand opening of electronics and appliance retailer Curacao at the Meadows Mall on Oct. 1. Los Angeles-based CBRE Group predicts local retails will have a bit of holiday cheer. Among the major trends for 2016 the company analysts identified was the continued growth of electronic commerce, although it remains a sliver of overall retail sales nationally, projected to account for 10.7 percent of holiday sales. The rise of e-commerce has been especially beneficial to Southern Nevada, said Darin Mellott, director of research and analysis for the CBRE Southwest region. He believes online commerce has created a demand in the local market that otherwise would not exist in traditional retail models. “There is a confluence of events, not just e-commerce but also costs relative to California, where again the key is, you have got to be close to the consumers,” he said. In the race to provide the most immediate service, retailers are turning to non-traditional shipping options, such as Uber and Lyft. She expects the categories of food and beverage, health and beauty, sporting goods and sporting apparel to perform strongly, as well as home goods, an area especially affected negatively during the recession. Retailers who have reduced toy inventories year-round will look to expand their presence seasonally, with many turning to pop-up stores in available spaces the same way retailers provide Halloween-related products and apparel. A major category in which sales are expected to remain sluggish is apparel, a trend Cordero says is forcing shopping centers to seek new strategies to attract customers. Health and wellness retail is one area of diversification many malls are seeking, as well as non-traditional entertainment attractions, such as the seasonal Rock Rink at Downtown Summerlin and the Seaquest Aquarium, opening Dec. 2 at the Boulevard Mall. Another trend is the demise of Black Friday as the designated day of touted sales to lure early shoppers. The shock election of Donald Trump to the U.S. presidency has caused significant fluctuations in world stock markets and deep apprehension in many Americans, but Cordero doubts those fears will create a significant impact on holiday consumer activities. “We saw a little decrease in quarter three, and there is conjecture that this was from the uncertainty leading up to the election — consumers just weren’t sure what would happen and were holding back,” she said. She said consumer confidence is a mCordero notes that changes in fiscal policy that accompany new administrations rarely are felt by individuals immediately, and she believes that realization will ease short-term spending apprehension. Looking beyond the holiday season, Mellott expects Southern Nevada to benefit — at least in the short term — from an expansionary fiscal policy stemming from Republican control of the legislative and executive branches. Mellott noted possible downsides to proposed policies, including the risk of a trade war with key economic partners, which has the potential to trigger a worldwide recession. But that might depend significantly on the current economic level of the consumer, according to Stephen Brown, Ph.D. of UNLV’s Lee Business School. “It is a trickle-down policy that largely favors providing bigger tax breaks for investment with the idea that it will stimulate economic activity,” he explained. Brown says the Republican congress might introduce bills intended to reduce spending, focused largely on social services, but that the income tax reduction is unlikely to pay for itself through economic growth, based on historical precedent and analysis of current factors.